Last year, the folks behind one of my favorite events, OC Brew Ha Ha, hosted the inaugural Sabroso Craft Beer and Taco Festival. This year, the event is back to coincide with Cinco de Mayo! I had so much fun last year, if you want to read about it, here is my write up from last year. I'm sure that the event will be even more fun than last year since it seems that every event that the OC Brew Ha Ha team puts together just gets better with each year! Once again, the Sabroso Craft Beer & Taco Festival will be held at Oak Canyon Park in Silverado. I love this venue, because it is close enough to major freeways, yet far enough out of the way to make it feel as if you are not near a major metro area, like Orange County. Sabroso will take place on Saturday, May 2nd from noon to 4 p.m.. Entrance to Sabroso will include unlimited tastings of over sixty beers as well as $3 tacos for purchase from a variety of outstanding local restaurants. Featured chefs who will be preparing tasty tacos include Greg Daniels of Haven Gastropub, Cody Storts of GRITS, Hop Phan of Dos Chinos Food Truck, as well as the award-winning culinary team from Taps Fish House. Along with beer and tacos, Sabroso also offers great entertainment such as live music and Lucha Libre wrestling. The wrestling was definitely a highlight of the event for me last year! The El Smoko Loco Cigar Lounge "Presented by Gray Cloud" will offer cigar conniesurs an opportunity to enjoy themselves during the fun-filled afternoon. I highly recommend attending Sabroso as it is a great bargain for all that it offers! Tickets to Sabroso are $55 in advance. In the event that tickets are still available the day of the event, tickets will be $65 at the door. For those who are interested in purchasing a designated driver ticket, those are available with the purchase of a regular event ticket. Tickets for Sabroso Craft Beer & Taco Festival are available for purchase online here. 12:00 p.m.-4:00 p.m., processing of event attendees will begin at 11:00 a.m.
Tickets include a commemorative festival glass, which is a great souvenir! Sabroso Craft Beer and Taco Festival is a 21+, rain or shine event. Beef and beer. They go together like freedom and happiness. If you've ever wanted to combine the two, listed below is one of my favorite recipes. 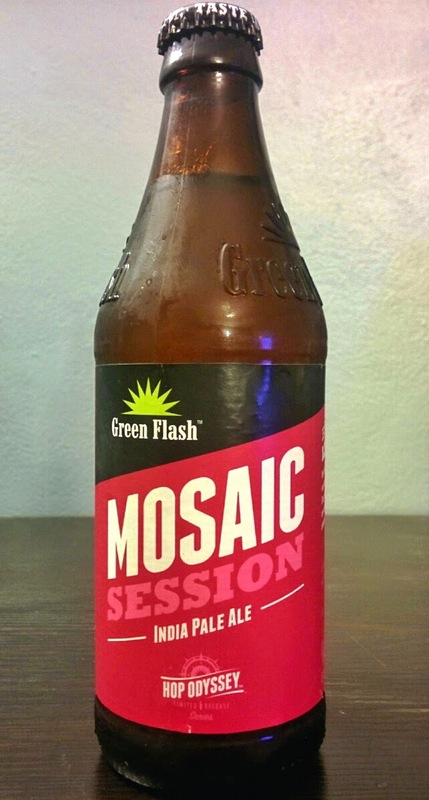 Ensure you have some beer on hand to enjoy while cooking, because it helps to make things better. The beers listed below, have all been used with great success for this recipe. Combine the marinade ingredients in a blender and puree. Put the steak in a gallon ziplock bag and pour the marinade in until the meat is covered. 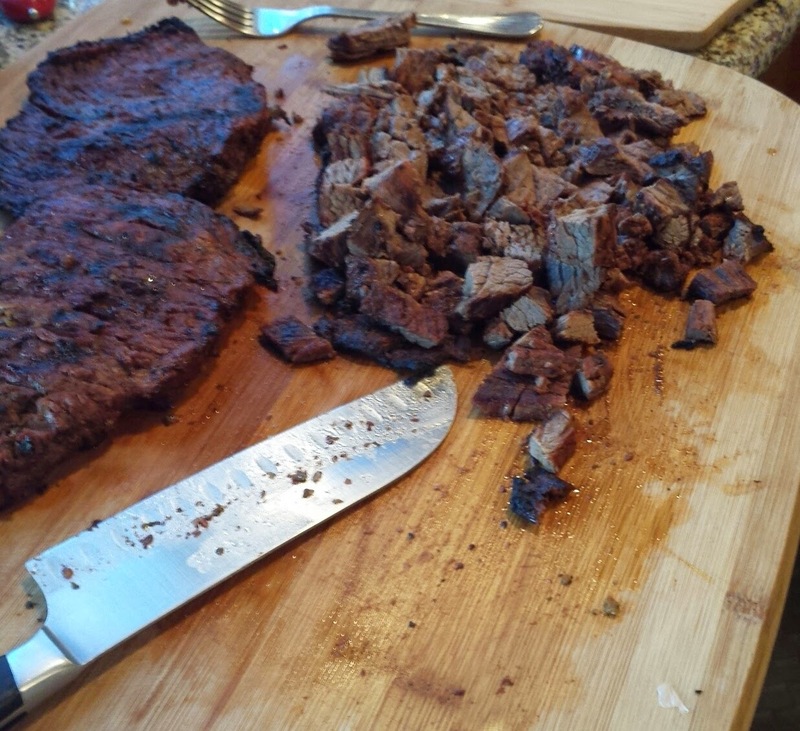 After you have finished grilling, cut the beef into small pieces. 20 Years of Adventure with Indiana Jones! Like a younger family member growing older, when I heard Indiana Jones Adventure at Disneyland was turning twenty this year, I was a bit surprised. Had it really been TWO decades since Adventure Land had forever changed?? 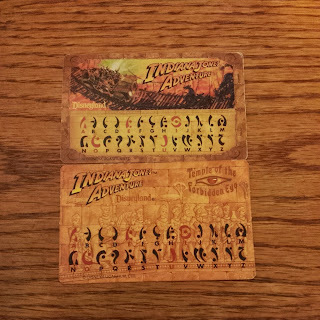 Decoder cards from Indiana Jones Adventure, yes, I save everything. I still remember the first time I went on the ride (yes, I know it's officially called an "attraction."). 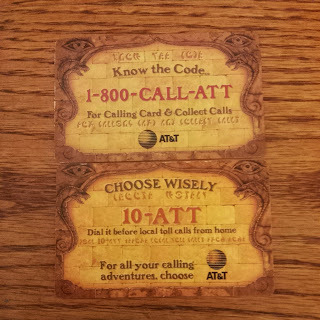 Upon approaching the queue, I was handed a small card that was able to be used to decode messages throughout the queue. I thought this was such a fun idea! It definitely helped pass the time while waiting. Seeing one of my favorite childhood movies transformed into a ride was amazing! Fast forward twenty (!) 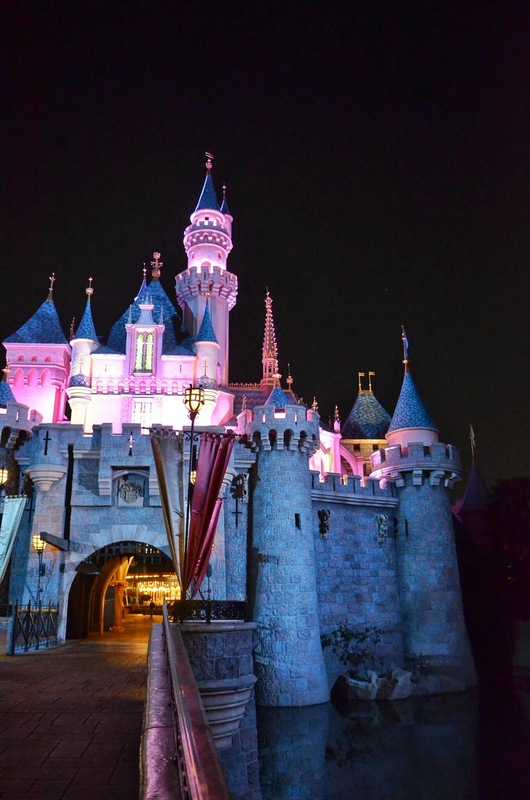 years, and Disneyland decided to celebrate with a celebration for Annual Passholders. As soon as I heard about the event, I signed up. I've attended other Annual Passholder events, but never during my favorite month of the year, March. Guide for the event which included a decoder card and of course I had to get a birthday button! 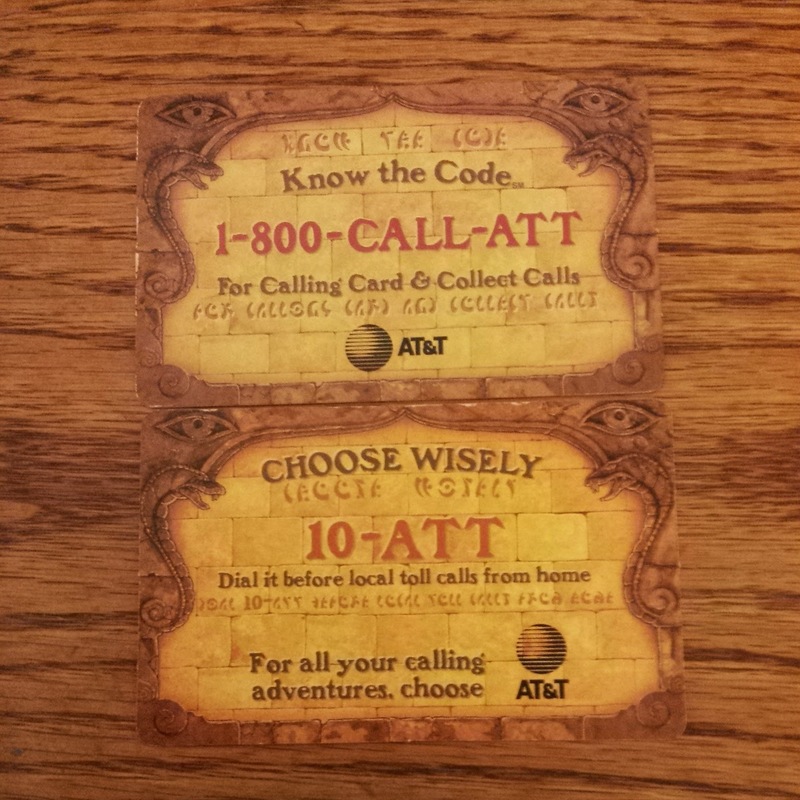 After quickly checking in near the ticket booths, we were handed a guide with a decoder attached. Gotta say, I'm a sucker for freebies, especially when they are unique event specific items! With nobody in line at the entrance turnstiles, we were inside the park after a few minutes of checking in. 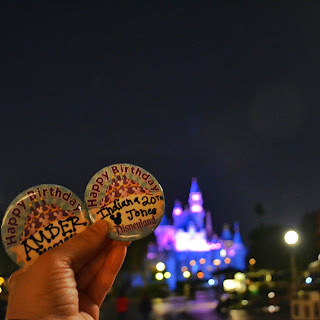 My first priority of the night was to visit City Hall on Main Street to get birthday buttons for both myself and Indy. The CM who helped me was so sweet and gave buttons to both me and my boyfriend. I'm glad she found it amusing that I wanted a birthday button for Indy rather than odd. I was so happy to see that the park was very uncrowded. 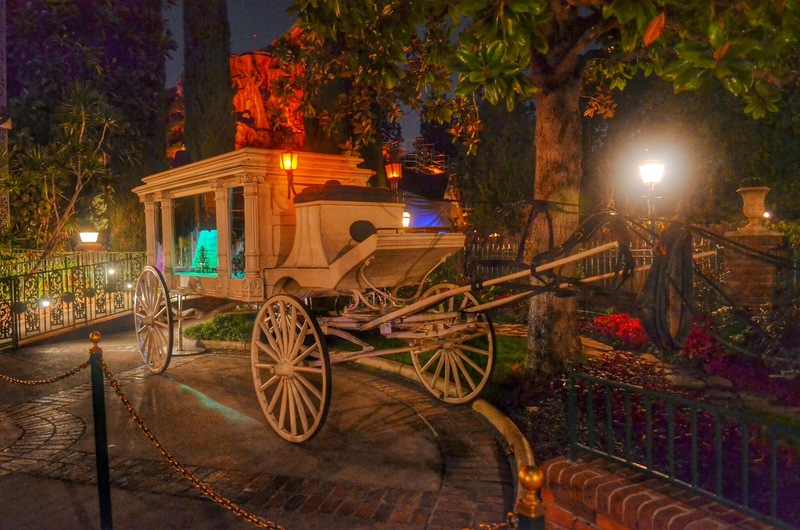 As a lifelong Disneyland visitor, my childhood memories include days when the park was less busy than it is nowadays. After walking down Main Street, and taking obligatory photos of Sleeping Beauty's Castle, it was time to have some adventure! I would not want this job! During the event, the West Side of Disneyland was open, so we started off by visiting Frontier Land. The wait for Thunder Mountain Railroad was only ten minutes, which is a rarity. After riding the wildest ride in the wilderness, we headed to visit the fellow birthday celebrant, Indiana Jones Adventure. 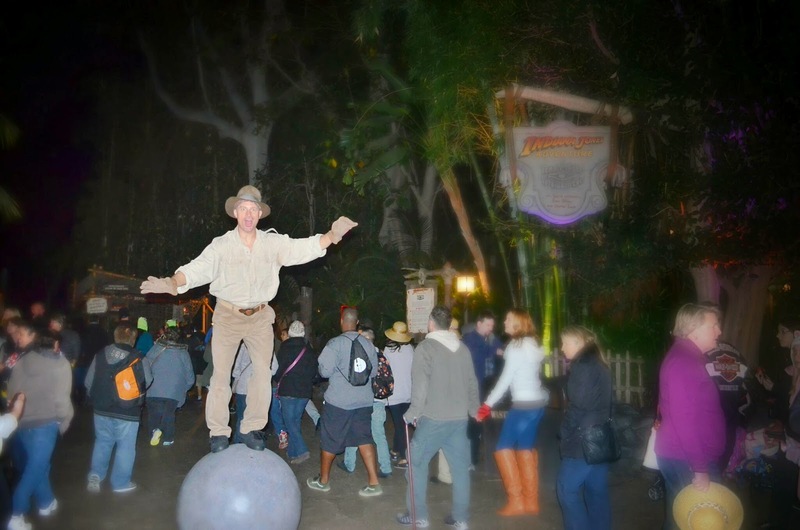 Near the queue entrance was a man balancing on a boulder. I couldn't watch him for too long, because I was worried he would fall! 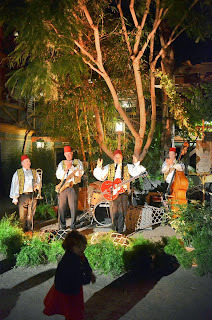 There was also a fez wearing band, The Joneses playing music whuch really added to the ambiance. Thankfully, after a short twenty minute wait, we survived the huge boulder at the end of Indy. It was then time to visit my second favorite house in Anaheim, the Haunted Mansion. I was so happy that there wasn't a line, which was also the case for Pirates of the Caribbean! Throughout the West Side of the park, mellow retro music reminiscent of the time period of Indiana Jones was playing, which was a nice touch. There was also a special showing of Fantasmic, as well as a panel discussion with Tony Baxter, both of which we decided to skip. 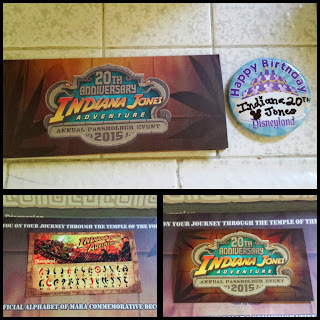 The 20th birthday celebration for Indiana Jones Adventure was a wonderful time. Being able to celebrate my favorite day of the year at one of my favorite places was fantastic. I hope that Disneyland continues to offer these special events for Annual Passholders!